This stamped cross stitch sampler is in our Beginner Series sewn on ivory linen. It is a larger cross stitch for beginners or for those who wish to have their samplers grow quickly, while simple to execute with charming results. 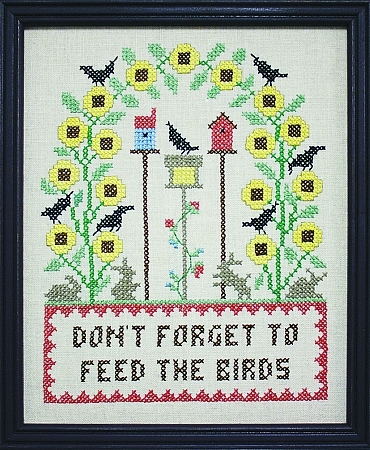 A cherished reminder to feed our fine feathered friends,while enjoying their natural beauty.A cross stitch sampler combining birds feasting on sunflower seed ,while their bunny friends are waiting for some of the dropped seeds.A Gardening and Craft sampler made for a sunny room in your home and a reminder that our friends must eat too. I just completed this one; I changed 2 of the birds to red birds and one to a blue jay; I made this for my sister, since she and I both feed the birds; I'm having it professionally framed. beautiful linen, beautiful piece. I finished this item and it is framed and on the wall. Whatfun it is to finish these wonderful pieces and disolay them. Everything was excellent in the kit. Thanks for the care in making up these wonderful pieces. This was a fun sampler to stitch. The print was clear and the floss was great.